Whooping cough (also known as pertussis or 100-day cough) is a highly contagious bacterial disease. Initially, symptoms are usually similar to those of the common cold with a runny nose, fever, and mild cough. This is followed by weeks of severe coughing fits. Following a fit of coughing, a high-pitched whoop sound or gasp may occur as the person breathes in. The coughing may last for 10 or more weeks, hence the phrase "100-day cough". A person may cough so hard that they vomit, break ribs, or become very tired from the effort. Children less than one year old may have little or no cough and instead have periods where they do not breathe. The time between infection and the onset of symptoms is usually seven to ten days. Disease may occur in those who have been vaccinated, but symptoms are typically milder. A young boy coughing due to pertussis. Pertussis is caused by the bacterium Bordetella pertussis. It is an airborne disease which spreads easily through the coughs and sneezes of an infected person. People are infectious from the start of symptoms until about three weeks into the coughing fits. Those treated with antibiotics are no longer infectious after five days. Diagnosis is by collecting a sample from the back of the nose and throat. This sample can then be tested by either culture or by polymerase chain reaction. Prevention is mainly by vaccination with the pertussis vaccine. Initial immunization is recommended between six and eight weeks of age, with four doses to be given in the first two years of life. Protection from pertussis decreases over time, so additional doses of vaccine are often recommended for older children and adults. Antibiotics may be used to prevent the disease in those who have been exposed and are at risk of severe disease. In those with the disease, antibiotics are useful if started within three weeks of the initial symptoms, but otherwise have little effect in most people. In pregnant women and children less than one year old, antibiotics are recommended within six weeks of symptom onset. Antibiotics used include erythromycin, azithromycin, clarithromycin, or trimethoprim/sulfamethoxazole. Evidence to support interventions for the cough, other than antibiotics, is poor. About 50% of infected children less than a year old require hospitalization and nearly 0.5% (1 in 200) die. An estimated 16.3 million people worldwide were infected in 2015. Most cases occur in the developing world, and people of all ages may be affected. In 2015, pertussis resulted in 58,700 deaths – down from 138,000 deaths in 1990. Outbreaks of the disease were first described in the 16th century. The bacterium that causes the infection was discovered in 1906. The pertussis vaccine became available in the 1940s. The classic symptoms of pertussis are a paroxysmal cough, inspiratory whoop, and fainting, or vomiting after coughing. The cough from pertussis has been documented to cause subconjunctival hemorrhages, rib fractures, urinary incontinence, hernias, and vertebral artery dissection. Violent coughing can cause the pleura to rupture, leading to a pneumothorax. Vomiting after a coughing spell or an inspiratory whooping sound on coughing, almost doubles the likelihood that the illness is pertussis. The absence of a paroxysmal cough or posttussive emesis, though, makes it almost half as likely. The illness usually starts with mild respiratory symptoms include mild coughing, sneezing, or a runny nose. This is known as the catarrhal stage. After one to two weeks, the coughing classically develops into uncontrollable fits, followed by a high-pitched "whoop" sound in younger children, or a gasping sound in older children, as the person tries to inhale (paroxysmal stage). This stage usually lasts two to eight weeks, or sometimes longer. A gradual transition then occurs to the convalescent stage, which usually lasts one to four weeks. This stage is marked by a decrease in paroxysms of coughing, although paroxysms may occur with subsequent respiratory infection for many months after the onset of pertussis. The time between exposure and the development of symptoms is on average 7–14 days (range 6–20 days), rarely as long as 42 days. Pertussis is caused by the bacterium Bordetella pertussis. It is an airborne disease (through droplets) that spreads easily through the coughs and sneezes of an infected person. Uncertainties have existed of B. pertussis and whooping cough as a zoonotic disease since around 1910 but in the 1930s, knowledge was gained that the bacteria lost their virulent power when repeatedly spread on agar media. This explained the difficulties to reproduce results from different studies as the pre-inoculating handlings of the bacteria were not standardized among scientists. Today it is established that at least some primate species are highly susceptible to B. pertussis and develop clinical whooping cough in high incidence when exposed to low inoculation doses. The bacteria may be present in wild animal populations, but this is not confirmed by laboratory diagnosis, although whooping cough is known among wild gorillas. Several zoos also have a long-standing custom of vaccinating their primates against whooping cough. After the bacteria are inhaled, they initially adhere to the ciliated epithelium in the nasopharynx. Surface proteins of B. pertussis, including filamentous hemaglutinin and pertactin, mediate attachment to the epithelium. The bacteria then multiply. In infants, who experience more severe disease, the bacteria spread down to the lungs. The bacteria secretes a number of toxins. Tracheal cytotoxin, a fragment of peptidoglycan, kills ciliated epithelial cells and thereby inhibits the mucociliary elevator by which mucus and debris are removed. TCT may contribute to the cough characteristic of pertussis. The cough may also be caused by a yet-to-be identified "cough toxin". Pertussis toxin causes lymphocytosis by an unknown mechanism. The elevated number of white blood cells leads to pulmonary hypertension, a major cause of death by pertussis. In infants who develop encephalopathy, cerebral hemorrhage and cortical atrophy occur, likely due to hypoxia. A physician's overall impression is most effective in initially making the diagnosis. Single factors are much less useful. In adults with a cough of less than 8 weeks, vomiting after coughing or a "whoop" is supportive. If there are not bouts of coughing or there is a fever the diagnosis is unlikely. In children who have a cough of less than 4 weeks vomiting after coughing is somewhat supportive but not definitive. Methods used in laboratory diagnosis include culturing of nasopharyngeal swabs on a nutrient medium (Bordet-Gengou medium), polymerase chain reaction (PCR), direct fluorescent antibody (DFA), and serological methods (e.g. complement fixation test). The bacteria can be recovered from the person only during the first three weeks of illness, rendering culturing and DFA useless after this period, although PCR may have some limited usefulness for an additional three weeks. Serology may be used for adults and adolescents who have already been infected for several weeks to determine whether antibody against pertussis toxin or another virulence factor of B. pertussis is present at high levels in the blood of the person. A similar, milder disease is caused by B. parapertussis. The primary method of prevention for pertussis is vaccination. Evidence is insufficient to determine the effectiveness of antibiotics in those who have been exposed, but are without symptoms. Preventive antibiotics, however, are still frequently used in those who have been exposed and are at high risk of severe disease (such as infants). Pertussis vaccines are effective at preventing illness and are recommended for routine use by the World Health Organization and the United States Centers for Disease Control and Prevention. The vaccine saved an estimated half a million lives in 2002. The multicomponent acellular pertussis vaccine is 71–85% effective, with greater effectiveness against more severe strains. However, despite widespread vaccination, pertussis has persisted in vaccinated populations and is today "one of the most common vaccine-preventable diseases in Western countries". The 21st-century resurgences in pertussis infections is attributed to a combination of waning immunity and bacterial mutations that elude vaccines. Immunization does not confer lifelong immunity; a 2011 CDC study indicated that protection may only last three to six years. This covers childhood, which is the time of greatest exposure and greatest risk of death from pertussis. An effect of widespread immunization on society has been the shift of reported infections from children aged 1–9 years to infants, adolescents, and adults, with adolescents and adults acting as reservoirs for B. pertussis and infecting infants who have had fewer than three doses of vaccine. Infection induces incomplete natural immunity that wanes over time. A 2005 study said estimates of the duration of infection-acquired immunity range from 7 to 20 years and the different results could be the result of differences in levels of circulating B. pertussis, surveillance systems, and case definitions used. The study said protective immunity after vaccination wanes after 4–12 years. One study suggested that the availability of vaccine exemptions increases the number of pertussis cases. Some studies have suggested that while acellular pertussis vaccines are effective at preventing the disease, they have a limited impact on infection and transmission, meaning that vaccinated people could spread pertussis even though they may have only mild symptoms or none at all. The antibiotics erythromycin, clarithromycin, or azithromycin are typically the recommended treatment. Newer macrolides are frequently recommended due to lower rates of side effects. Trimethoprim-sulfamethoxazole (TMP/SMX) may be used in those with allergies to first-line agents or in infants who have a risk of pyloric stenosis from macrolides. A reasonable guideline is to treat people age >1 year within 3 weeks of cough onset and infants age <1 year and pregnant women within 6 weeks of cough onset. If the person is diagnosed late, antibiotics will not alter the course of the illness, and even without antibiotics, they should no longer be spreading pertussis. When used early, antibiotics decrease the duration of infectiousness, and thus prevent spread. Short-term antibiotics (azithromycin for 3–5 days) are as effective as long-term treatment (erythromycin 10–14 days) in eliminating B. pertussis with fewer and less severe side effects. People with pertussis are infectious from the beginning of the catarrhal stage (a runny nose, sneezing, low-grade fever, symptoms of the common cold) through the third week after the onset of paroxysms (multiple, rapid coughs) or until 5 days after the start of effective antimicrobial treatment. Effective treatments of the cough associated with this condition have not been developed. Disability-adjusted life year for pertussis per 100,000 inhabitants as of 2004. While most healthy older children and adults fully recover, infection in newborns is particularly severe. Pertussis is fatal in an estimated 0.5% of US infants under one year of age. First-year infants are also more likely to develop complications, such as: apneas (31%), pneumonia (12%), seizures (0.6%) and encephalopathy (0.15%). This may be due to the ability of the bacterium to suppress the immune system. Worldwide, whooping cough affects around 16 million people yearly. One estimate for 2013 stated it resulted in about 61,000 deaths – down from 138,000 deaths in 1990. Another estimated 195,000 child deaths yearly from the disease worldwide. This is despite generally high coverage with the DTP and DTaP vaccines. Pertussis is one of the leading causes of vaccine-preventable deaths worldwide. About 90% of all cases occur in developing countries. Before vaccines, an average of 178,171 cases was reported in the U.S., with peaks reported every two to five years; more than 93% of reported cases occurred in children under 10 years of age. The actual incidence was likely much higher. After vaccinations were introduced in the 1940s, pertussis incidence fell dramatically to approximately 1,000 by 1976. Incidence rates have increased since 1980. In 2015, rates in the United States were 20,762 people. Pertussis is the only vaccine-preventable disease that is associated with increasing deaths in the U.S. The number of deaths increased from four in 1996 to 17 in 2001, almost all of which were infants under one year. In Canada, the number of pertussis infections has varied between 2,000 and 10,000 reported cases each year over the last ten years, and it is the most common vaccine-preventable illness in Toronto. In 2009 Australia reported an average of 10,000 cases a year, and the number of cases had increased. In the U.S. pertussis in adults has increased significantly since about 2004. 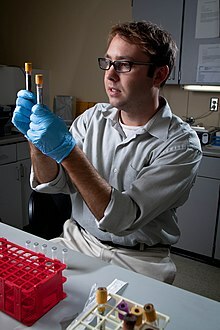 An epidemiologist tests blood samples for pertussis during a 2010 outbreak. In 2010 ten infants in California died, and health authorities declared an epidemic encompassing 9,120 cases. They found that doctors had failed to correctly diagnose the infants' condition during several visits. Statistical analysis identified significant overlap in communities with a cluster of nonmedical child exemptions and cases. The number of exemptions varied widely among communities, but tended to be highly clustered. In some schools, more than three-fourths of parents filed for vaccination exemptions. The data suggest vaccine refusal based on nonmedical reasons and personal belief exacerbated the outbreak. Other factors included reduced duration of immunity following the acellular vaccine and, the fact that most vaccinated adults and older children had not received a booster shot. In April and May 2012 pertussis was declared to be at epidemic levels in Washington, with 3,308 cases. In December 2012 Vermont declared an epidemic of 522 cases. Wisconsin had the highest incidence rate, with 3,877 cases, although it did not make an official epidemic declaration. B. pertussis was discovered in 1906 by Jules Bordet and Octave Gengou, who also developed the first serology and vaccine. Efforts to develop an inactivated whole-cell vaccine began soon after B. pertussis was cultured that year. In the 1920s, Louis W. Sauer developed a weak vaccine for whooping cough at Evanston Hospital (Evanston, IL). In 1925 Danish physician Thorvald Madsen was the first to test a whole-cell vaccine on a wide scale. Madsen used the vaccine to control outbreaks in the Faroe Islands in the North Sea. In 1932 an outbreak of whooping cough hit Atlanta, Georgia, prompting pediatrician Leila Denmark to begin her study of the disease. Over the next six years her work was published in the Journal of the American Medical Association, and in partnership with Emory University and Eli Lilly & Company, she developed the first pertussis vaccine. In 1942 American scientists Grace Eldering, Loney Gordon, and Pearl Kendrick combined the whole-cell pertussis vaccine with diphtheria and tetanus toxoids to generate the first DTP combination vaccine. To minimize the frequent side effects caused by the pertussis component, Japanese scientist Yuji Sato developed an acellular vaccine consisting of purified haemagglutinins (HAs: filamentous strep throat and leukocytosis-promoting-factor HA), which are secreted by B. pertussis. Sato's acellular pertussis vaccine was used in Japan starting in 1981. Later versions of the acellular vaccine in other countries consisted of additional defined components of B. pertussis and were often part of the DTaP combination vaccine. ^ a b c d e f g h i j "Pertussis (Whooping Cough) Signs & Symptoms". May 22, 2014. Archived from the original on 7 February 2015. Retrieved 12 February 2015. ^ a b c "Pertussis (Whooping Cough) Complications". cdc.gov. August 28, 2013. Archived from the original on 9 February 2015. Retrieved 12 February 2015. ^ a b "Pertussis (Whooping Cough) Fast Facts". cdc.gov. February 13, 2014. Archived from the original on 7 February 2015. Retrieved 12 February 2015. ^ a b c d "Pertussis (Whooping Cough) Causes & Transmission". cdc.gov. September 4, 2014. Archived from the original on 14 February 2015. Retrieved 12 February 2015. ^ a b c "Pertussis (Whooping Cough) Specimen Collection". cdc.gov. August 28, 2013. Archived from the original on 8 February 2015. Retrieved 13 February 2015. ^ a b c d e f g h Heininger U (February 2010). "Update on pertussis in children". Expert Rev Anti-infect Ther. 8 (2): 163–73. doi:10.1586/eri.09.124. PMID 20109046. ^ a b c d e f "Pertussis (Whooping Cough) Treatment". cdc.gov. August 28, 2013. Archived from the original on 11 February 2015. Retrieved 13 February 2015. ^ Carbonetti NH (June 2007). "Immunomodulation in the pathogenesis of Bordetella pertussis infection and disease". Curr Opin Pharmacol. 7 (3): 272–8. doi:10.1016/j.coph.2006.12.004. PMID 17418639. ^ a b c d Atkinson, William (May 2012). Pertussis Epidemiology and Prevention of Vaccine-Preventable Diseases (12th ed.). Public Health Foundation. pp. 215–230. ISBN 9780983263135. Archived from the original on 2017-07-29. ^ "Pertussis". WHO. Archived from the original on 5 June 2015. Retrieved 23 March 2016. ^ "Revised guidance on the choice of pertussis vaccines: July 2014" (PDF). Wkly Epidemiol Rec. 89 (30): 337–40. Jul 2014. PMID 25072068. Archived (PDF) from the original on 2015-02-13. ^ "Pertussis vaccines: WHO position paper". Wkly Epidemiol Rec. 85 (40): 385–400. Oct 1, 2010. PMID 20939150. ^ "Pertussis (Whooping Cough) Prevention". cdc.gov. October 10, 2014. Archived from the original on 8 February 2015. Retrieved 13 February 2015. ^ a b c Wang, K; Bettiol, S; Thompson, MJ; Roberts, NW; Perera, R; Heneghan, CJ; Harnden, A (22 September 2014). "Symptomatic treatment of the cough in whooping cough". Cochrane Database of Systematic Reviews. 9: CD003257. doi:10.1002/14651858.CD003257.pub5. PMID 25243777. ^ a b c d Cornia PB, Hersh AL, Lipsky BA, Newman TB, Gonzales R (August 2010). "Does this coughing adolescent or adult patient have pertussis?". JAMA. 304 (8): 890–6. doi:10.1001/jama.2010.1181. PMID 20736473. ^ Pertussis (whooping cough) Archived 2013-07-22 at the Wayback Machine, New York State Department of Health, Updated: January 2012, retrieved 8 June 2013. ^ Inaba I (1912). "Über den Bordet-Gengouschen Keuchhustenbacillus Übertragungsversuches des Keuchenhustens auf Tiere". Z Kinderheilkd. 4: 252–264. doi:10.1007/bf02088879. ^ Bachamn W, Burghard E (1925). "Der Nachweis der Bordet-Gengouschen Bacillen und ihre aetiologische Bedeutung für den Keuchenhusten". Z Kinderheilkd. 39: 465–483. ^ Shibley, GS; Hoelscher, H (1934). "Studies on whooping cough. I. Type-specific (S) and dissociation (R) forms of haemophilus pertussis". J Exp Med. 60 (4): 403–418. doi:10.1084/jem.60.4.403. PMC 2132401. PMID 19870311. ^ Gustavsson OE, Röken BO, Serrander R (1990). "An Epizootic of Whooping Cough among Chimpanzees in a Zoo". Folia Primatol. 55: 45–50. doi:10.1159/000156498. ^ Warfel JM, Merkel TJ (Oct 2014). "The baboon model of pertussis: effective use and lessons for pertussis vaccines". Expert Rev Vaccines. 13 (10): 1241–52. doi:10.1586/14760584.2014.946016. ^ Loomis MR (1985). "Immunoprofylaxis in infant great apes". In Graham CE; Bowen JA. Clinical Management of Infant Great Apes. Monographs in Primatology. 5. New York: Liss. pp. 107–112. ^ Top, Karina A.; Halperin, Scott A. (2017). "Pertussis and other Bordetella infections". In Kasper, Dennis L.; Fauci, Anthony S. Harrison's Infectious Diseases (3 ed.). New York: McGraw-Hill Education. pp. 502–506. ISBN 9781259835971. ^ a b c d Kilgore PE, Salim AM, Zervos MJ, Schmitt HJ (July 2016). "Pertussis: Microbiology, Disease, Treatment, and Prevention". Clinical Microbiology Reviews. 29 (3): 449–86. doi:10.1128/CMR.00083-15. PMC 4861987. PMID 27029594. ^ a b Hewlett EL, Burns DL, Cotter PA, Harvill ET, Merkel TJ, Quinn CP, Stibitz ES (April 2014). "Pertussis pathogenesis--what we know and what we don't know". The Journal of Infectious Diseases. 209 (7): 982–5. doi:10.1093/infdis/jit639. PMC 3952676. PMID 24626533. ^ Melvin JA, Scheller EV, Miller JF, Cotter PA (April 2014). "Bordetella pertussis pathogenesis: current and future challenges". Nature Reviews. Microbiology. 12 (4): 274–88. doi:10.1038/nrmicro3235. PMC 4205565. PMID 24608338. ^ Cherry JD (2013). "Pertussis: challenges today and for the future". PLoS Pathogens. 9 (7): e1003418. doi:10.1371/journal.ppat.1003418. PMC 3723573. PMID 23935481. ^ a b Ebell, MH; Marchello, C; Callahan, M (2017). "Clinical Diagnosis of Bordetella Pertussis Infection: A Systematic Review". J Am Board Fam Med. 30 (3): 308–319. doi:10.3122/jabfm.2017.03.160330. PMID 28484063. ^ a b c Moore, A; Harnden, A; Grant, CC; Patel, S; Irwin, RS; CHEST Expert Cough, Panel. (January 2019). "Clinically Diagnosing Pertussis-associated Cough in Adults and Children: CHEST Guideline and Expert Panel Report". Chest. 155 (1): 147–154. doi:10.1016/j.chest.2018.09.027. PMID 30321509. ^ Pedro-Pons, Agustín (1968). Patología y Clínica Médicas (in Spanish). 6 (3rd ed.). Barcelona: Salvat. p. 615. ISBN 84-345-1106-1. ^ "Pertussis". Euro Diagnostica. Euro Diagnostica AB. Archived from the original on 4 March 2016. Retrieved 29 February 2016. ^ Finger H, von Koenig CH (1996). Baron S, et al., eds. Bordetella–Clinical Manifestations. In: Barron's Medical Microbiology (4th ed.). Univ of Texas Medical Branch. ISBN 0-9631172-1-1. Archived from the original on 2007-10-14. ^ "Pertussis | Whooping Cough | Vaccination | CDC". www.cdc.gov. Archived from the original on 26 May 2017. Retrieved 27 May 2017. ^ a b Altunaiji S, Kukuruzovic R, Curtis N, Massie J (2007-07-18). "Antibiotics for whooping cough (pertussis)". Cochrane Database of Systematic Reviews (3): CD004404. doi:10.1002/14651858.CD004404.pub3. PMID 17636756. ^ a b Zhang, L; Prietsch, SO; Axelsson, I; Halperin, SA (Sep 17, 2014). "Acellular vaccines for preventing whooping cough in children". Cochrane Database of Systematic Reviews. 9: CD001478. doi:10.1002/14651858.CD001478.pub6. PMID 25228233. ^ a b "Annex 6 whole cell pertussis" (PDF). World Health Organization. Archived (PDF) from the original on 24 March 2012. Retrieved 5 June 2011. ^ "Pertussis: Summary of Vaccine Recommendations". Centers for Disease Control and Prevention. Archived from the original on 29 June 2011. Retrieved 5 June 2011. ^ a b Mooi; et al. (Feb 2013). "Pertussis resurgence: waning immunity and pathogen adaptation—two sides of the same coin". Epidemiol Infect. Oxford University Press. 142: 1–10. doi:10.1017/S0950268813000071. Archived from the original on 2013-11-12. ^ van der Ark; et al. (Sep 2012). "Resurgence of pertussis calls for re-evaluation of pertussis animal models". Expert Rev Vaccines. 11 (9): 1121–1137. doi:10.1586/erv.12.83. PMID 23151168. ^ Versteegh FG, Schellekens JF, Fleer A, Roord JJ (2005). "Pertussis: a concise historical review including diagnosis, incidence, clinical manifestations and the role of treatment and vaccination in management". Rev Med Microbiol. 16 (3): 79–89. doi:10.1097/01.revmedmi.0000175933.85861.4e. ^ Mattoo, Seema; Cherry, James D. (2005-04-01). "Molecular Pathogenesis, Epidemiology, and Clinical Manifestations of Respiratory Infections Due to Bordetella pertussis and Other Bordetella Subspecies". Clin Microbiol Rev. 18 (2): 326–382. doi:10.1128/CMR.18.2.326-382.2005. ISSN 0893-8512. PMC 1082800. PMID 15831828. ^ Disease Control Priorities Project. (2006). Vaccine-Preventable Diseases (Table 20.1, page 390 "Archived copy" (PDF). Archived from the original (PDF) on 2007-02-05. Retrieved 2007-02-24. CS1 maint: Archived copy as title (link)). International Bank for Reconstruction and Development, World Bank. Washington DC (www.worldbank.org). ^ Wendelboe AM, Van Rie A, Salmaso S, Englund JA (2005). "Duration of immunity against pertussis after natural infection or vaccination". Pediatr Infect Dis J. 24 (5 Suppl): S58–61. doi:10.1097/01.inf.0000160914.59160.41. PMID 15876927. Archived from the original on 2014-02-02. ^ Yang YT, Debold V (2014). "A longitudinal analysis of the effect of nonmedical exemption law and vaccine uptake on vaccine-targeted disease rates". Am J Public Health. 104 (2): 371–7. doi:10.2105/AJPH.2013.301538. PMC 3935668. PMID 24328666. ^ Srugo, Isaac; Benilevi, Daniel; Madeb, Ralph; Shapiro, Sara; Shohat, Tamy; Somekh, Eli; Rimmar, Yossi; Gershtein, Vladimir; Gershtein, Rosa; Marva, Esther; Lahat, Nitza (October 2000). "Pertussis Infection in Fully Vaccinated Children in Day-Care Centers, Israel". Archived from the original on 2 April 2016. ^ "Pertussis Vaccines:WHO Position Paper" (PDF). August 2015. Archived (PDF) from the original on 4 March 2016. It is plausible that in humans, as in nonhuman primates, asymptomatic or mildly symptomatic infections in DTaP-immunized persons may result in transmission of B. pertussis to others and may drive pertussis outbreaks. ^ Altunaiji, S; Kukuruzovic, R; Curtis, N; Massie, J (Jul 18, 2007). "Antibiotics for whooping cough (pertussis)". Cochrane Database of Systematic Reviews (3): CD004404. doi:10.1002/14651858.CD004404.pub3. PMID 17636756. ^ Wang, K; Bettiol, S; Thompson, MJ; Roberts, NW; Perera, R; Heneghan, CJ; Harnden, A (Sep 22, 2014). "Symptomatic treatment of the cough in whooping cough". Cochrane Database of Systematic Reviews. 9: CD003257. doi:10.1002/14651858.CD003257.pub5. PMID 25243777. ^ a b "Pertussis: Complications". Centers for Disease Control and Prevention. Archived from the original on 14 August 2012. Retrieved 24 August 2012. ^ Carbonetti, Nicholas H (March 2010). "Pertussis toxin and adenylate cyclase toxin: key virulence factors of Bordetella pertussis and cell biology tools". Future Microbiol. 5 (3): 455–469. doi:10.2217/fmb.09.133. PMC 2851156. PMID 20210554. ^ "Pertussis | Whooping Cough | Cases in Other Countries | CDC". www.cdc.gov. Archived from the original on 2016-03-01. Retrieved 2016-03-01. ^ a b "Pertussis in Other Countries". Centers for Disease Control and Prevention (CDC). Archived from the original on 12 May 2013. Retrieved 27 May 2013. ^ "Pertussis | Whooping Cough | Surveillance | Cases by Year | CDC". www.cdc.gov. Archived from the original on 10 April 2017. Retrieved 10 April 2017. ^ Gregory DS (2006). "Pertussis: a disease affecting all ages". Am Fam Physician. 74 (3): 420–6. PMID 16913160. Archived from the original on 2008-05-16. ^ Lavelle P (January 20, 2009). "A bad year for whooping cough". Australian Broadcasting Corporation. Archived from the original on October 26, 2009. ^ Kate Murphy. "Enduring and Painful, Pertussis Leaps Back" Archived 2013-05-24 at the Wayback Machine. The New York Times. 22 February 2005. ^ Miriam Falco (October 20, 2010). "Ten infants dead in California whooping cough outbreak". CNN. Archived from the original on October 21, 2010. Retrieved 2010-10-21. Whooping cough, also known as pertussis, has claimed the 10th victim in California, in what health officials are calling the worst outbreak in 60 years. ^ "Pertussis (Whooping Cough) Outbreaks". Centers for Disease Control and Prevention. January 11, 2011. Archived from the original on July 19, 2017. ^ Rong-Gong Lin II (September 7, 2010). "Diagnoses lagged in baby deaths". Los Angeles Times. Archived from the original on September 10, 2010. Retrieved 2010-09-08. ^ Shute, Nancy (30 September 2013). "Vaccine Refusals Fueled California's Whooping Cough Epidemic". NPR. Archived from the original on 5 October 2013. Retrieved 6 October 2013. ^ Atwell JE, Van Otterloo J, Zipprich J, Winter K, Harriman K, Salmon DA, Halsey NA, Omer SB (2013). "Nonmedical vaccine exemptions and pertussis in California, 2010". Pediatrics. 132 (4): 624–30. doi:10.1542/peds.2013-0878. PMID 24082000. ^ Donna Gordon Blankinship (May 10, 2012). "Whooping cough epidemic declared in Wash. state". Associated Press, Seattle Times. Archived from the original on 13 May 2012. Retrieved 14 May 2012. ^ Washington State Department of Health (April 2012). "Whooping cough cases reach epidemic levels in much of Washington" (PDF). Washington State Department of Health. Archived from the original (PDF) on 20 January 2015. Retrieved 14 May 2012. ^ a b Karen Herzog (Aug 17, 2012). "Wisconsin has highest rate of whooping cough". the Journal Sentinel. Archived from the original on 19 August 2012. Retrieved 17 August 2012. ^ Johnson, T. (December 13, 2012). "Whooping cough epidemic declared in Vermont". Burlington Free Press. Retrieved 14 December 2012. ^ Baker JP, Katz SL (2004). "Childhood vaccine development: an overview". Pediatr Res. 55 (2): 347–56. doi:10.1203/01.PDR.0000106317.36875.6A. PMID 14630981. ^ "Changing the Face of Medicine | Dr. Leila Alice Daughtry Denmark". www.nlm.nih.gov. Archived from the original on 2015-03-21. Retrieved 2016-02-03. ^ Bannink, Jill. "Finding aid for the Michigan women and the whooping cough vaccine collection[s]" (PDF). Archived (PDF) from the original on 2015-02-05. ^ Sato Y, Kimura M, Fukumi H (1984). "Development of a pertussis component vaccine in Japan". The Lancet. 1 (8369): 122–6. doi:10.1016/S0140-6736(84)90061-8. PMID 6140441. Wikimedia Commons has media related to Pertussis.